Hotel Art Resort Galleria Umberto, Naples. Art Resort Galleria Umberto Hotel Naples. Do you want to stay in Naples in a unique, stylish, charming and comfortable structure located in a strategic situation? Hotel Art Resort Galleria Umberto is a unique 4-star deluxe hotel, situated in the famous Galleria Umberto I, at a few steps from Piazza del Plebiscito, Royal Palace, Teatro San Carlo and Maschio Angioino, the heart of the city, destination chosen by millions of tourists from all over the world. The hotel boasts a classic elegance in the typical baroque style so famous in Naples, offering rare ambiences inside a historic monument of the city, thought as an ancient noble house of the 1850. From the walls to the marbles, all is characterized by luxury and the most typical style of the city that stands out from the large mirrors, cream colours of the ceilings, little and big statues of the crib as well as porcelains of Capodimonte. 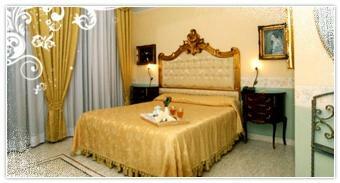 If you chose to stay here, you can enjoy the real essence of the Neapolitan character. The hotel, even if it is characterized by its traditional style, has at its disposal the most modern technologies and comforts that will give you a peaceful holiday, tranquillity encircled by every service and amenity. The check-in is from 14.00 to 00.00 while the check-out is from 07.00 to 11.00. The structure has at its disposal a private parking in the neighbourhood of the hotel. The domestic animals are admitted but you have you ask in advance (free stay). In the morning, before to go and be immersed in the unique charm of this city, from 07.00 to 10.30 in a splendid ambience, which overlooks the Galleria Umberto, we will serve you a rich buffet breakfast.